Strengths: Sabrewulf has some of the scariest rushdown in the game. He has far-reaching high-low mixups, and he can dash through opponents to create left-right situations any time he is remotely near, making him unpredictable on offense and a scary reset character. His footsies are extremely potent for a rushdown character, which lets which lets him play a solid game to back up moments of reckless abandon. He also has a very strong instinct mode. Weaknesses: Sabrewulf has a very shallow jump, which can make it difficult to approach characters who control lots of horizontal space; in order to get in, he must commit to using Diving Slash and Hamstring. Despite having a good shadow reversal, he has a poor backdash which will force you to make solid reads on your wakeup to survive, and without meter, Sabrewulf must block all of the offensive character's pressure on his wakeup. Notes: Normally, you never want to do heavy linkers during a character's counter break combos, because they take time away from the high damage heavy auto-doubles. In Sabrewulf's case, however, his heavy Jumping Slash linker (performed by and holding MK) hits extremely hard, enough to make it the go-to option, even over his rabid double combo trait. You can squeeze a light double in at the end of the meterless combo, or start dumping shadow moves into the combo to increase the damage substantially. If you have only one bar to spend, use it on the shadow linker rather than the shadow ender. Ragged Edge is safe on block if you use the lighter versions, but it is always a 2-hit attack and can be identified by Sabrewulf's claws glowing blue. If you use it late in your block string pressure, it will be relatively easy to shadow counter, so it is better to try and hit-confirm your combo openings, typically by using Overwhelm or chained crouching jabs. Sabrewulf has a strong high-low game by canceling any normal into Run, then immediately performing Hamstring (low) or Jumping Slash (high). They are potent as mixup and reset tools, especially when combined with his forward dash which passes through opponents, giving Sabrewulf a five-way mixup including left-right options and throws. Hamstring and Jumping Slash are both unsafe on block, so Sabrewulf will need to take a risk to use them. If your opponent does not convert a blocked mixup into big damage, continue to use these tools liberally. While difficult, you can watch for Sabrewulf's pouncing animation to try and more reliably block Jumping Slash on reaction. Shadow Ragged Edge has exceedingly long range and starts up very fast, making it an excellent whiff punishing tool or as a reversal for marginally unsafe on block moves. Shadow Jumping Slash is Sabrewulf's primary way to go through strong mid-range projectiles or stop opponents from jumping away (due to its recapture properties), but you need to be relatively close to use it. If you dash from around half screen and then use it on reaction to an opponent's action, they will be nervous to use those options in the future, which will allow Sabrewulf more liberties on offense in the future. 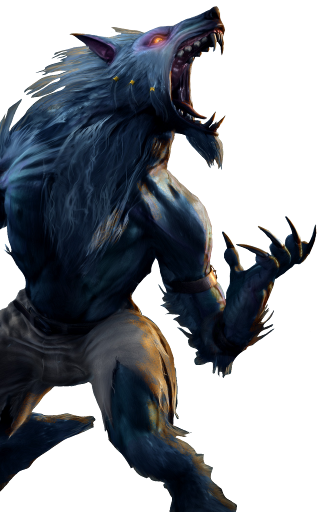 All of Sabrewulf's primary offensive tools are openers, and thus activate traditional Killer Instinct grounded combos, but in some situations he is able to start a juggle combo. Running Uppercut is a great move to use in the neutral game to check your opponent from moving forward too much, and if one of them lands, you can begin a juggle combo, or immediately use a sweep or flipout attack for a knockdown or reset attempt. Standing heavy kick causes a stagger state, which means fishing with this normal during pressure, and then reacting to the hit to continue your combo, is not a bad idea to sprinkle into your offense. Like Jago, Sabrewulf's linkers are the same as his openers. Hamstring (LK after Run) and Jumping Slash (MK after Run) are unique linkers; holding down LK for a heavy linker will cause a three-hit Hamstring attack, while holding down MK for a heavy linker will cause a three-hit Jumping Slash attack. Light and medium perform one-hit and two-hit versions of Hamstring and Jumping Slash, respectively, as expected. This means if you see a Jumping Slash linker, for example, it is limited to being either a medium or heavy attack. Ragged Edge linkers often look rather similar to Sabrewulf's auto-doubles, which can make him difficult to combo break. Shadow Jumping Slash as a linker piles on the damage very quickly, and is great to throw in during surprise lockout situations because it finishes so quickly. Sabrewulf's shadow linkers are not overly difficult to break. He is one of the few characters in KI that has a linker with no lockout gaps between the hits, but there is a bit of a delay after the end of the shadow freeze, so make sure to wait for Sabrewulf to make contact with you before you begin to break Shadow Jumping Slash. For Shadow Ragged Edge, Sabrewulf begins to animate the downward swiping of his claw during the latter stages of super freeze, and the first break window happens as soon as Sabrewulf begins to move at full pace. He seems to hang on to the swiping animation abnormally long, so you'll need to delay your first break attempt accordingly. Or, alternatively, it is easy to break the third, fourth, and fifth hits of this linker once the sound effects for the first two give away the rhythm of the hits. Sabrewulf has no battery ender, so when he is mid-screen, he should opt for either his Eclipse damage ender, which cashes out hard but ends Sabrewulf's offense, or his Running Uppercut launcher ender, which sets up a safe jump, a juggle, or a sweep, each of which allows Sabrewulf to continue pressure. Unlike many other enders of its type, shadow Eclipse does good damage and allows for a juggle afterwards, which means Sabrewulf can finish with a shadow ender and still cause a flipout if he chooses. In the corner, you should probably use the Ragged Edge wall splat ender often, because Sabrewulf gets more reset potential than other characters after a wall splat due to his ability to dash through opponents. Sabrewulf can choose to spend a bar of shadow meter to recapture during his relatively rare juggle combos (for example, after a Running Uppercut or shadow Eclipse), but his primary use for this move will be to react to backwards jumps during his pressure and convert into a large grounded combo. He does, however, make excellent use of flipout, due to the strength of his launcher ender and his ability to dash through opponents and threaten from all sides. If you are playing a Sabrewulf player who likes to use flipout, you will need to combo break light attacks after you've been juggled and force him to use other attacks or take a risk on a counter breaker. Sabrewulf's instinct is strong. His normals can now cause chip damage, while his specials do quite a bit more chip than before. If your opponent is low on life, he will have to be careful of this threat. But most importantly, Sabrewulf gains the ability to feral cancel any move on hit, block, or even whiff (yikes) just by pressing HP+HK, which cancels the move immediately into a small number of recovery frames. Sabrewulf will be unable to perform another feral cancel for about 1.5 seconds, but each cancel gives Sabrewulf an opportunity to take a chance on one of his normally-risky high-low, left-right mixups on you, perform a shadow Eclipse reversal that can't be punished, or stop a move before it can be shadow countered. If he starts canceling moves on whiff to fake putting you in block stun before his mixups, it will be very difficult to escape taking big damage without a clutch combo breaker. Sabrewulf has a large collection of strong normals to complement his rushdown game. Crouching LP is excellent, especially after post-dash mixups. It has good range, chains into itself and can be canceled into an opener as a hit confirm quite easily. Sabrewulf's sweep, crouching HP, is an excellent long-range footsies tool which can start his offense. If you're looking to apply close-range pressure, standing MK is a beefy meaty attack at 7 active frames, excellent for thwarting non-invincible escape options and conditioning an opponent to sit still, while crouching LK is an almost unreasonable +4 on block and can harass opponents even though it can't be chained. Crouching HK works great as an anti-air. If you're looking to alter your jump arc, use the Diving Slash air command normal. This will help you avoid projectiles and attack from deceptively far ranges during your approach. Perhaps the star normal of his arsenal is Overpower, a command normal ( +HP) which lunges Sabrewulf very far forward and generates advantage on block. It is fast for a heavy attack and has a hitbox that is difficult to contest. Mixing in Overpower after crouching light attacks will bring Sabrewulf back in after being pushed out, while keeping his frame advantage high. In order to stop this, opponents have to try to jump, shadow counter after blocking Overpower, or perform an invincible reversal, but many of these ideas become difficult if Sabrewulf holds HP to charge Overpower, which keeps Sabrewulf in a leaned back pose for longer, out of the reach of attacks, and alters the timing of his pressure significantly. If you're feeling bold, you can even hold HP for a long time until Sabrewulf automatically attacks; this makes Overpower unblockable. While risky, you can catch tentative opponents with a deer-in-the-headlights reaction more often than you might expect. For strong Sabrewulf offense, using Run and its followups is key. You should prefer to use the HK version of Run most of the time, since it travels the fastest; use Hamstring to slide under certain high attacks and attack from very far away, and use Jumping Slash to catch defenders who are scared of Sabrewulf's good low attacks. While both attacks are unsafe if they are blocked, good Sabrewulf players need to keep the fear of these attacks present in the defender's mind often. You can also execute Running Uppercut after Run, which looks a lot like a normal attack; Sabrewulf simply swings a large paw in front of his face. While it has no mixup potential like the other Run followups, it is safe on block, excellent in footsies, and allows Sabrewulf to threaten with throws or crouching LPs, especially if a defender was expecting a high or a low attack and is not ready to challenge after blocking it. Shadow Eclipse is a fantastic reversal and anti-air attack which is easy to react with, since it's a motion with no charge attached. If you have two stocks of shadow meter to burn, you can do shadow Jumping Slash after shadow Eclipse to recapture opponents and continue a grounded combo, or you could juggle with a sweep or flipout attack for less cost and start an offensive sequence. Sabrewulf backs up his extremely threatening rushdown with a surprisingly strong capability for patient footsies and defensive play. Sabrewulf is fully able to play a defensive turtle game using Running Uppercut, sweep, and safe Ragged Edge, just enough to lull you into not reacting to a surprise Hamstring or Jumping Slash at footsies range. Once Sabrewulf gets close, he's free to run the show until you guess right, and you might lose an entire health bar if you're on the wrong end of a few mixups. If he has activated instinct, try to weather the storm or completely run away to the best of your ability. It is possible to abuse Sabrewulf's weaknesses and zone him out, but eventually he will find a way to make you guess on a mixup. Just make sure your punishes hurt when you guess correctly, or this character will run a train on you. Show me a slippery ice alien.